Rich will encore with us in September with analysis & commentary after the IOC announces their final selections of Host Cities (and order) for the Games in 2024 and 2028. This includes which City (Paris or Los Angeles) is awarded 2024 and then 2028’s Host City. Chef Dean Thomas is the Executive Chef at Europa Village Winery in Temecula as well as the Innkeeper at the adjacent Inn at Europa Village. His from-scratch, 2-course breakfasts with International themes for the Inn’s guests are the talk of Temecula Valley. Chef Dean has just returned from a Europa Village organized, 7-night AmaWaterways river cruise through Provence starting in Barcelona and ending in Paris. He was in Paris during the recent tragic events. Chef Dean suggests to travel to Europe without fear. We’ll share in the culinary highlights with Chef Dean himself including a meal at Chef Paul Bocuse’s l’Auberge du Pont de Collonges in Lyon. At Europa Village on Friday, November 27th is “Vivi Bene.” It’s their festive antidote to “Black Friday” starting at 10:00 a.m. From 5 to 8:00 p.m. there will be Strolling Carolers and Chef Dean’s Delights including bread pudding, mulled wine, cider, butternut squash bisque and house-made preserves. Award-winning author, Susan Herrmann Loomis, is with us to talk about her newest book, In a French Kitchen: Tales and Traditions of Everyday Home Cooking in France. This book, with tales about real French cooks and more than 85 recipes, proves that delicious, decadent meals are simple and easy to create. Susan takes lessons from busy, everyday French cooks and offers their tips and tricks, kitchen wisdom, and recipes to create meals focused on local, seasonal, quality ingredients. She regales us with tales of the French at the table, offers twelve seasonal menus, and pairs wines with her dishes to make this book an enjoyable read and an indispensable friend in the kitchen. Susan is a France-based (Normandy), award winning journalist with ten books to her credit, a cooking school proprietor, and a professionally trained chef. She offers cooking classes in both Paris and Louviers. It’s a pleasure to welcome food journalist Barbara Fairchild back to the show. She is an editor, writer, speaker and consultant. She was the long-time Editor of Bon Appetit Magazine before the publication relocated to New York. Her newest position is Restaurant & Travel Editor for grapecollective.com. Based on her recent travels Barbara has restaurant finds for us from both London and Paris. Bistro Bellet in the 10th Arrondissement is Barbara’s pick for Paris. The Chef is Francois Chenel (ex-Chez Michel.) It’s an emerging area for better restaurants. It’s two levels of prix fixe menus with lots of choices within each category. Price is highly reasonable for the quality of the cuisine. Multiple James Beard Award-winning Pastry Chef Sherry Yard is familiar to the listening audience of the “SoCal Restaurant Show.” Her work-in-progress is the ambitious revival of the Helms Bakery in Los Angeles on the border with Culver City. She will tell us all about her exciting new position as Corporate Vice President of the Culinary Division of iPic Theaters. Watching a movie on the big screen should be a deluxe experience with food to match ! There is a relatively new hidden gem of a very personal farm-to-table restaurant in Venice. That’s Barnyard Venice. Come hungry and prepare to be pleasantly surprised and also well-taken care of. Nan Kohler, the Managing Partner of Grist & Toll – An Urban Flour Mill, is back for an encore. This time she’ll also be speaking about gluten-free. Barbara Fairchild, the well-traveled Restaurant & Travel Editor for grapecollective.com is back with us to share some inspired restaurant finds from her recent travels both in Europe and in The States. The Winery Restaurant & Wine Bar in Tustin has a new location on the Bay in Newport Beach. It’s a “wow” of a spot! In late 2012 she left Spago to realize a dream project with Sang Yoon. That’s the reopening (and revamping) of the fondly remembered Helms Bakery in Los Angeles on the border of Culver City. She has just stepped into the newly created position of Corporate Vice President of Culinary Direction for iPic Theaters. Their new state-of-the-art Westwood complex has just opened. Locally-sourced gourmet food is now on the menu for the luxury movie viewing experience. The iPic Theaters menu for Westwood even includes Helms Treats. There are premium signature cookies and even frozen novelties! On the ground floor there is an Italian restaurant (Tanzy) open to the public for lunch and dinner. Sherry Yard was on hand Sunday, April 25th on Rodeo Dr. in Beverly Hills to observe the cutting of Chef Donald Wressell’s breathtaking birthday cake for the 100th Anniversary of the City of Beverly Hills. Chef Donald is the corporate chef for Guittard Chocolate Co. Sherry has created incredible desserts for the Oscars and was truly impressed with the incredible results. 15,000 slices of deliciousness were served! Adding a needed basement to the Helms Bakery (where there was none before) has delayed the project. Sherry is now looking at a 2015 launch. His grilled octopus is a standout. Ramen Tuesday is at the bar. Nan Kohler is the Managing Partner of Grist & Toll – An urban Flour Mill in Pasadena. She has extensive background in baking. Nan discusses her take on celiac disease and the growing need for gluten-free products. On Sunday, May 4th Chef Bruce Kalman of Pasadena’s Union is cooking a dinner in conjunction with Grist & Toll. Union uses many of their products including their polenta which is a favorite of Chef Jet’s. Chef Kalman will incorporate Grist & Toll’s whole-grain milled fresh flours into five courses. The price is $85 per guest. Nan explains how the flours produced by Grist & Toll differ from the commercial enriched flour that goes into plain white bread. A lot of the nutritional value is surprisingly lost with the processing of conventional enriched flour. Nan is also starting to offer baking classes. The Winery Restaurant & Bar at the District in Tustin has created quite a splash over the last six years. All that was missing was an ocean view. Newly arrived on the Bay in Newport Beach is the 2nd location for The Winery Restaurant & Wine Bar. Partner/ Executive Chef Yvon Goetz is overseeing the kitchen here, too. It’s dinner only at present. Lunch will be coming on the weekends. Chef Yvon is our guest. The new Winery brings the same distinctive experience as its flagship location in The District in Tustin. This one strives to make the guest feel like they have been transported to a relaxing getaway in Napa or Sonoma. This escape features ocean views from the second-story dining room and breathtaking bar. The menu here is a bit more seafood centric. Some of the fish (Opah, Ono, and Mahi Mahi) +is flown in from Hawaii daily. “The major difference with this location will be the stunning views of the waterfront and boat access. We anticipate endless possibilities, with something to suit every palate,” said JC Clow, Managing Partner of The Winery Restaurant & Wine Bar. Three private docks are available for guests to arrive via the Marina. Chef Instructor Elizabeth Whitt is, fortunately, no stranger to the show. When Chef Jet has a culinary quandary he goes right to Chef Elizabeth. She is a Le Cordon Bleu, Paris trained chef with expertise in both hot foods and pastry. She lived in Paris for 12 years and is fluent in the language. In this segment Elizabeth talked about pumpkin. Should it be fresh or can it be canned? Also, the step-by-step instructions for preparing and baking the perfect, classic pumpkin pie. Chef Elizabeth has a great tip about when to use fresh pumpkin. If the recipe is half-pumpkin (as an ingredient total) then by all means use fresh. Elizabeth has an “Appetizers and Hors D’oeuvres” class coming up on December 5th from 6:30 to 9:00 p.m.
Dreading the thought of the big, high-anxiety Thanksgiving holiday meal preparation? Don’t despair…It’s our calming Thanksgiving special and we’ll put you at ease with practical advice from the cooking pros. We have you covered. Chef Jet and Producer Andy preview the Thanksgiving special. Sam Sifton is back with us providing more helpful Thanksgiving education. He offers his two favorite side dish recipes. Those are Three-Pepper Sausage Cornbread Dressing, and Roasted Cauliflower with Anchovy Bread Crumbs. Chef Instructor Elizabeth Whitt is no stranger to the show. When Chef Jet has a culinary quandary he goes right to Chef Elizabeth. She is a Le Cordon Bleu, Paris trained chef with expertise in both hot foods and pastry. In this segment Elizabeth talks about pumpkin. Should it be fresh or can it be canned? Also, the step-by-step instructions for preparing and baking the perfect, classic pumpkin pie. Chef Instructor Elizabeth Whitt continues with genuinely useful Thanksgiving cooking help. She explains what dishes can be successfully prepared ahead to save time (and limited oven & burner space) on the big day. Chef Elizabeth also shares her easy recipe for her favorite Thanksgiving side dish for her own Thanksgiving table. Jet and Chef Elizabeth Whitt offer their Thanksgiving advice in responding to listeners’ questions. It’s everything from how do you know when a persimmon is ripe to what are the most creative ideas for using the abundant leftovers. Also everything you want to know about cooking deep-fried turkey and the path to preparing the perfect stuffing. William Lewis is the award-winning sommelier and partner in The Winery Restaurant and Wine Bar located in The District in Tustin. For the second year in a row they were awarded The Golden Foodie for Best Wine List in Orange County in 2013. They were also just recognized with OpenTable’s 2013 Diner’s Choice Award for Notable Wine List. Whether your preference for your Thanksgiving table is a pairing of a fine white, sparkling, or red wine William has the selection of the perfect match for each that will both impress and not break the bank. William Lewis, the popular sommelier and partner of The Winery Restaurant and Wine Bar located in The District in Tustin returns to complete his inspired Thanksgiving wine pairings. He also talks about digestives for the finale of your Thanksgiving meal. It might be brandy, cognac, Calvados or even the Italian Fernet-Branca. Look for the debut of The Winery Restaurant’s elegant new eagerly anticipated location on Pacific Coast Highway in Newport Beach in February of 2014! Feeling ambitious in the kitchen…? Time to get a running start on holiday cooking and entertaining. Our superstar chef instructor, Elizabeth Whitt, of www.ChefElizabeth.com is with us again to get those holiday preparations pointed in the right direction with relative ease. Pumpkin is in this year. Chef Elizabeth has both a savory and sweet recipe to add to your holiday collection. First up is an incredible Pumpkin Risotto with a fresh baking pumpkin or butternut squash. For dessert there is a not too sweet Pumpkin Cheesecake. Yum….! When Chef Jet has his own culinary questions he turns Le Cordon Bleu, Paris-trained to Chef Elizabeth. She has a series of popular holiday classes coming up that always sell out early. On November 7th she has “Make-Ahead Holiday Side Dishes” from 11:00 a.m. to 1:30 p.m. and “Holiday Pies and Desserts” the same day from 6:30 p.m. to 9:00 p.m.
Then on December 5th its her most popular class, “Appetizers and Hors D’oeuvres,” from 6:30 p.m. to 9:00 p.m.
All classes are at the Cypress Community Center in Cypress. Thanks to all of our loyal & enthusiastic listeners who were part of the audience for Jet’s Saturday afternoon cooking demo with Ben McKee of The Imagine Dragons at the Life Is Beautiful food and music festival in Downtown Las Vegas. It was standing room only for the demo in the Chefs On Stage East tent. Jet and Andy preview the show. We have everything from a snapshot on where to dine now in New York to what it takes to prepare and serve gourmet food to the demanding VIPs at the Breeder’s Cup at Santa Anita. Also we’ll get the behind-the-scenes with a winning chef from Food Network’s new hit series “Cutthroat Kitchen” hosted by Alton Brown. Jet is one of the regular judges for the first season. Barbara Fairchild is a respected food journalist, cookbook author, consultant, and educator. 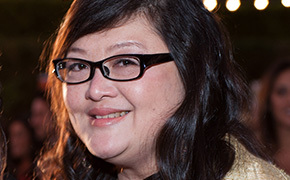 She is best known to us as the long-time former editor of Bon Appetit Magazine when they were based in Los Angeles. This summer she taught a course in the Arthur L. Canter Journalism Institute at the prestigious New York University. Barbara tells us all about that as well as provides us with some great Manhattan dining suggestions ranging from a deli find to fine dining Italian and a comfortable celebrity chef restaurant that’s really worth going to. Chef Merrin-Mae is a cheftestant on the first season of Food Network’s high pressure “Cutthroat Kitchen” hosted by Alton Brown. Her episode is entitled “Kiss My Grits” and was first aired on October 6th. The level of competition was particularly intense and the sabotages were devilish. Chef Merrin-Mae made us proud in SoCal (she is a local) and she won the episode. One of the other cheftestants was a “Chopped” winner and was eliminated after the first round! She currently works at Alma with executive chef Ari Taymor. When she did the show she was part of the culinary team at Sotto. Food journalist Jason Kessler of Food Republic and Bon Appetit was actually on the diet for 40 days and shares his experience with us. Jason’s observation is that because the diet is so restrictive you can drop some weight rather quickly. The severely limiting factor is that it gets monotonous rather fast. San Diego, we haven’t forgotten you. Anita Lau of the Mad Hungry Woman blog is with us with a San Diego dining discovery. Anita was a nominee for a Golden Foodie award in Journalism this year. Anita’s find is Ristorante Kaz. This is an intriguing Japanese Italian fusion cuisine spot. Anita’s favorite bite was an angel hair pasta dish with creamy sea urchin with spinach and salmon roe. Fifteen years ago when fine-dining restaurants located outside of the protective umbrella of luxury hotels were at a low ebb in Los Angeles Chef Josiah Citrin sold his stake in a very popular Santa Monica dinner house and went out on his own to open a ultra-luxe, destination, freestanding, fine-dining, contemporary French restaurant with California accents. That was the start of Melisse. All these years later it still impresses. Josiah is a new member of the Bocuse d’Or USA Foundation’s prestigious Culinary Council. On November 10th Josiah and five other culinary superstars will join forces to cook an extraordinary six course repast at Melisse in Santa Monica to raise funds for The Foundation. Two different levels of wine-pairings are available for a supplement. The esteemed group of chefs includes Gavin Kaysen, the Executive Chef and Director of Culinary Operations for Daniel Boulud’s Café Boulud in New York, Palm Beach, and Toronto. He has previously represented the USA in the Bocuse d’Or culinary competition. For reservations please call 310.395.0881. The 2013 Breeder’s Cup, horse racing’s premier international event, returns to storied Santa Anita Park on November 1st and 2nd. Wolfgang Puck Catering (they cater the annual Governors Ball for The Oscars) has been selected to serve it’s fine-dining, seasonal cuisine to some 5,000 demanding VIP attendees. Wolfgang Puck Catering’s cuisine will be served in the Trackside Marquee, Frontrunner, Sierra Vista, Trophy Lounge and the Chandelier Room. Founding Executive Chef and Partner (of Wolfgang Puck Catering) Matt Bencivenga joins us to talk about the challenges of maintaining Spago quality at large events. It takes a lot of skill, planning, and an army of chefs.